Runs the gamut from be-bop to country to bossa nova but it's really best defined simply as All-American music, written, produced, and performed by Artie Kaplan himself. The enclosed is truly ArtieKaplanMusic. ArtieKaplanMusic runs the gamut from be-bop to country to bossa nova but it's really best defined simply as All-American music, written, produced, and performed by Artie Kaplan himself. Artie's music is the culmination of a lifetime of being in the record business, having played a pivotal musical role in the success of more than 150 Top Ten recordings over the past five decades. His saxophone can be heard on #1 songs by artists including Connie France's "My Heart Has A Mind Of It's Own", Neil Sedaka's "Happy Birthday Sweet Sixteen" and "Breaking Up Is Hard To Do", Little Eva's "Locomotion", The Chiffons "One Fine Day", Jay & The Americans "Come A Little Bit Closer", Len Barry's "1-2-3", Bobby Hebb's "Sunny", Spanky & Our Gang's "Sunday Will Never Be The Same", Van Morrison's "Brown Eyed Girl", Neil Diamond's "Solitary Man", Barry Manilow's "Mandy", the Archies "Sugar Sugar" and countless others. His unmistakable style made him one of the most in-demand session players of his time. Meanwhile, the 70s saw Kaplan change directions and become a singer/songwriter. The "Confessions Of A Male Chauvinist Pig" CD, the result of those changes, became a best seller in Europe. This CD contained two hits, "Harmony" and "Bensonhurst Blues" and continues a success in many European countries to this day, more than two decades after it's original release. The 80s and 90s saw Artie Kaplan devoting his musical talents to developing, composing, and performing on many different and varied projects. These projects include the CDs "Fun Time For Kids" and "Barnyard Stories and Poems", as well as a story book aimed at the lucrative children's market. This brings us to 2002 and Kaplan's latest endeavor which includes a variety of songs he has written over the past few years. These songs have been carefully crafted using Kaplan's five decades of experience in the music business. The music on this CD will evoke wonderful memories of everything from the classic Louis Armstrong to the timeless Louis Prima and beyond but all in Artie Kaplan's own inimitable style. Every song will grab your attention and take you on a journey through time only letting you stop long enough to get ready for the next exciting experience. Kaplan has carefully chosen the best of these songs and put them all together for this, his latest CD release. So do yourself a favor; listen to this CD in its entirety and be pleasantly surprised! It's guaranteed you'll like what you hear. 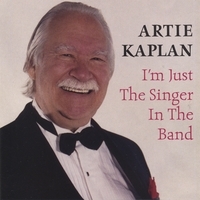 Artie Kaplans album I'm Just a singer in the band is great. I enjoyed every song on the CD. His singing and sax playing are outstanding.I am looking foward to his next CD. I would love to hear it played on the radio.